Mom, the Intern: Dancing, mermaids, your best girls ... what's not to love? Dancing, mermaids, your best girls ... what's not to love? It's summer, and if you're anything like me, you're seeing an awful lot of your kids these days. Like, maybe just a smidge TOO MUCH of them. Not that our children aren't adorable and the smartest and the very suns around which we revolve ... but, it's probably safe to admit we'd all like a little break from them for some grown-up girl time. Well, look no further! If you're in Arizona, I request you join me at an epic LADIES ONLY DANCE PARTY in just two weeks. 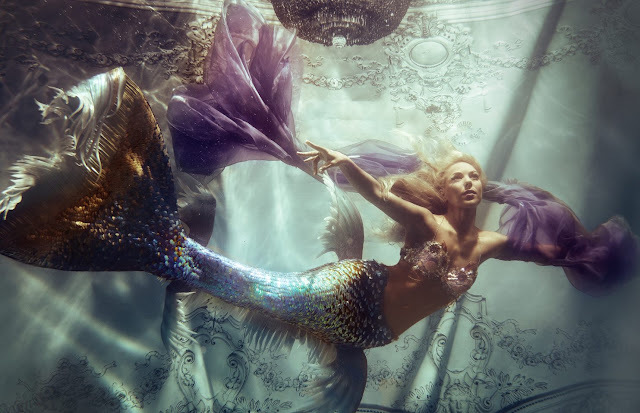 Here, you will release your inner mermaid and shake your tail fin with wild abandon a welcome distance away from your cherished litttle hellions angels. This is my friend Mandy Nielsen, actress and comedienne extraordinaire, in all her mermaid glory on the Santa Monica pier. She is hosting this shindig, and trust me -- she's one of those girls you want to be BFF's with. She's hilarious, fabulous and fun! Dance Dance: Mermaid Bae is happening at Jester'Z Improv (Mesa Riverview) on Thursday, June 30 from 8 - 11 PM. Ladies 18 and up welcome -- no mermen or merbabies allowed. You can expect a live DJ spinning today's danciest hits, a braid bar (complementary fishtail braid during the first hour), photo booth and more! And yes, there WILL be dancing ... lots of dancing. Be prepared to glisten! Mamas ... I beg you to take some time for yourselves and COME TO THIS. It's only three hours and your precious treasures will be sleeping soundly during all of it, so no mom guilt allowed! This is you! Photo from here. Don your most mermaid-esque attire -- sequins, colors, shimmer and anything else that says "aquatic beauty" to you and get your fins down to Jester'Z on June 30! Ladies -- let's make some WAVES! RSVP and get your tickets here. This post is sponsored. All expressed opinions are mine. I am planning to go to this. You better dance with me!